Villa Samira is set over three levels with a pair of two-storey pavilions flanking the grand entrance hall and a spa room and three guest bedrooms situated below the pool deck. 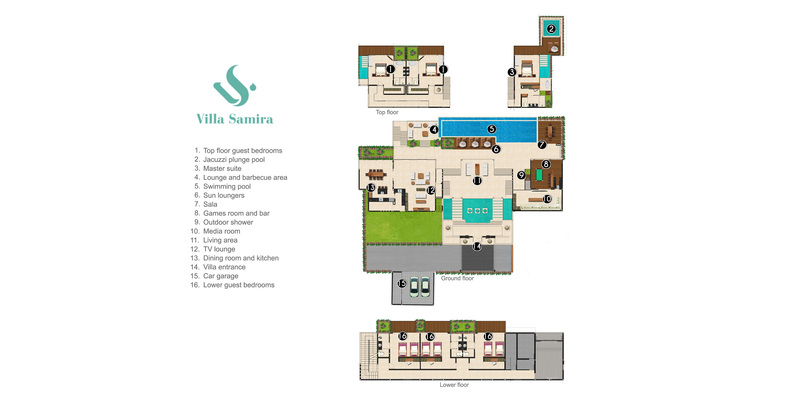 All the indoor and outdoor living spaces, including the wide pool terrace, games room, media room, living room, dining room and kitchen, are on the villa’s entry level. The large master suite occupies the entire top floor of one pavilion while two king-bedded guest rooms lie on the top floor of the opposite pavilion. All six bedrooms have sea-view balconies. Flanking the villa’s grand entrance and pool terrace are two pavilions housing Samira’s living areas. Villa Samira’s outdoor living spaces extend from the grand entrance hall, with a decked terrace bordering the pool, and a chic white poly-rattan sofa set for relaxing in the shade. The 17-metre pool and jacuzzi is a prime spot for taking in the sea and sky views. Six sunbeds are set on the raised wooden deck along the pool’s length. In front of the games room, at one end of the pool, is a dining sala for enjoying alfresco meals, while at the other end is a sitting area with a fire pit – the perfect spot for post-swim sunset cocktails. This romantic retreat boasts a huge wraparound balcony with a private jacuzzi plunge pool, sunbeds, a reflecting pool, double bathtub and outdoor shower. This bright, king-bedded room occupying the entire top floor of a pavilion is smartly furnished with an aquamarine loveseat and ottoman. Hidden behind the room’s study desk is a walk-in wardrobe and the luxurious ensuite bathroom where the rain shower’s glass enclosure gives it an outdoor feel. Two large king-bedded bedrooms share the top floor of a pavilion, each with fabulous sea views, private terraces, wardrobes and lavish ensuite bathrooms with double bathtubs. One of the bedrooms has a side terrace with a reflecting pool and outdoor shower. All five guest bedrooms are furnished with king-size beds. Three guest bedrooms in the lower floor can be converted to twin beds if preferred, giving great flexibility for couples, families and friends.